World heavyweight champion Wladimir Klitschko says he would welcome a fight against Britain's David Haye. Haye became undisputed cruiserweight champion with a two-round demolition of Enzo Maccarinelli earlier this month. However, he is expected to relinquish his titles as he attempts to crack the heavyweight division, currently dominated by Ukrainian Klitschko. Asked whether he would fight Haye, Klitschko told BBC Radio 5 Live: "He's an exciting fighter so why not?" Londoner Haye, 27, is expected to have his first tilt at heavyweight later this year and is hoping to become world champion within three years. "I'm 100% certain that I'll achieve more things at heavyweight than I have done at cruiserweight," Haye said earlier this month. "I'm not looking at boxing into my 31st year, so I've got two and a half years to get the job done. If the titles get unified, hopefully I'll just have to fight one guy." Haye called Klitschko's recent victory over Sultan Ibragimov embarrassing and he is convinced he can become Britain's first heavyweight champion since Lennox Lewis retired in 2004. "I'd fight [IBF and WBO heavyweight champion] Wladimir Klitschko in my next fight if I could after his pitiful fight against Sultan Ibragimov. "That was embarrassing and he wouldn't look forward to fighting someone with my kind of style - powerful, explosive and able to take him out with any shot." 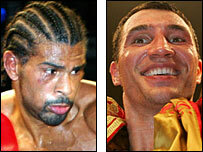 But Klitschko, 32, has warned Haye he better be able to fight as well as he talks. "I hadn't heard about David Haye at all until last month," said Klitschko. "But I've checked his record and he is a good fighter with a good record. "If he wants to bring excitement then I wish him best of luck. He better get himself in the gym and get ready to fight. "He is young and is trying to put attention on himself and that may work for him because he has to be very loud, but not only with his words but with his actions. I wish him the best of luck with that." Klitschko confirmed that he will defend his WBO belt against American Tony Thompson in Germany this summer. "Until the fight with David Haye I have to stay active as I am nervous and I have to get myself in shape," he said. "So I am going to fight in July against Thompson - he is the WBO's number one mandatory contender so I have chosen him."